Unless Michael Cohl takes my advice and brings the Rolling Stones to the stadium in Ulan Bator, Sunday's second show in Hong Kong really was it. No more -- at least until the next time. Thankfully, they ended the tour on a high note. Apart from a surprising adherence to Friday's set list, the show was essentially flawless, and certainly a more accomplished effort. It was a thrill to watch the locals around me get into the spirit even though they may not have been terribly familiar with the material. No one sat down, and if they did, it wasn't for long. Still, it was an overwhelmingly expatriate crowd. The Stones might just as well have been playing London. It's a pity they didn't use the big screens to play the England-Wales rugby match beforehand, which would have really set the English adrenalin running. As with Friday, the rain held off. The cooler temperature made things a little more pleasant. But security was much tighter, bordering on thuggish, and it wasn't possible for me to rush the stage this time. "Wild Horses," "Monkey Man," "Midnight Rambler" and "Before They Make Me Run" were added to the set list. The show began with the same 4 songs, and I was surprised that "Miss You" returned. Mick's stage banter was also little changed, though this time he did thank the people of Hong Kong for making the band feel welcome. He noted that this was the 117th show of the tour "and we're very pleased to be doing the last one in front of you." Before Keith launched into "Slipping Away," he said, "Sorry we took so long." After that song, he said, "Before they chase me out of town, this one's called 'Before They Make Me Run.'" He and Ronnie were color-coordinated with bright red tops for the second half of the show. Highlights for me included "You Can't Always Get What You Want," "Midnight Rambler" and "Street Fighting Man." When the bootleg comes out, listeners should pay attention to the latter song as Darryl broke a string, and spent much of the song adjusting the tuning for the remaining strings. The crowd could have sung "You Can't Always Get What You Want" all night; I don't know Mick doesn't let the chanting go on for a bit. But he did break down "Sympathy" to let us do the "woo-woos" a few times. Bill Clinton was not at Sunday's show. The wings were cleared of people this time. The Stones gave him what was possibly the worst seat in the house on Friday - about eye level with the backsides of the three back-up singers. When he left his seat during "Miss You," I was worried that he might come out and do a sax solo. I never thought I'd be so relieved to see Bobby's pasty face as he moved in to blow us all away. He loved the manga graphic for "Honky Tonk Women" and seemed enthralled by Lisa. The Stones and I leave town on Monday, on separate flights, alas. It's been a great 42 shows since September 2002, time to twiddle my thumbs impatiently for the next tour. The most remarkable element of The Rolling Stones concert, held at the Hong Kong skyscraper-backed Tamar Site Sunday night was the near sellout crowd�s bewilderment with each other. Locals and ex-pats � young and old, turned out to witness a show that was delayed 8 months by the SARS crisis. The threat of rain held off as Keith stroked the opening of �Brown Sugar� and the mix was tweaked. Charlie�s punctuated �Start Me Up� followed and the audience realized they were about to embark on an evening to remember. Keith switched guitars to his Berry black Gibson for �IORR� before �Don�t Stop� showed that �The Boys� have so many jewels in their vault. The thought of �Angie�, played Friday night, caused anxiety only to be swept away by �Wild Horses� with Ronnie stepping up nicely. A great trombone intro of �YCAGWYW� set the stage to test the voice of the crowd. If we couldn�t hear �Paint It Black� from Friday�s show, I was delighted by the substitution of �Monkey Man� � broken eggs and an unmade bed! Another switch from Friday was �Midnight Rambler� for �Can�t You Hear Me Knockin��, but no one was put off with its blues intro, although Charlie appeared to have trouble keeping up with the run-out. �Miss You� reminded of the disco days of the �80s in New York City, but Bobby Keys� sax prevented ennui. �Tumblin� Dice� returned the show to the images that drew fans to Hong Kong from around the world. Keith and Ronnie played subtle tricks with the mix and Mick challenged us geezers with his stage rambling. Perfunctory introductions with Mick in a naaf homburg brought a giggle. Keith�s �Slipping Away� contributed complementary video effects. However, the video director failed consistently to feature the soloist on many numbers, especially Chuck�s. Keith maybe tired of �Happy�, so he switched to �Before They Make Me Run�. Remarkable audience patience, placated by �Sympathy for the Devil�. I�m not sure I like the percussion loop with all those players on stage. �Gimme Shelter� was �the one�. Lisa honored Merry Clayton with chills on a tropical night. �You Got Me Rockin�� stood up with Ronnie�s nifty slide spice. Returning to strength with �Street Fighting Man�, poignant in Hong Kong, scene of 500,000 protesters in July. Too bad this show didn�t play in Beijing. We made the clubhouse turn with �Honky Tonk Women� and the cutest, most suggestive animation. I hope it makes it to DVD. �Satisfaction� wound up the set with memories of the summer of �65, Charlie�s propulsion and Keith�s chrome and purple ax � nuf sed. �Jumpin� Jack Flash� was the consummate encore and finale, leaving the crowd pleading for more. For all the hype and range of performance The Rolling Stones are still a dance band that can�t be beat. To answer a popular question, Sunday�s show was definitely the better of the two shows. Both the crowd and the band were more into it, with exactly who first got the evening rolling not entirely identifiable. The sing alongs were more spirited and interaction between band members suggested everyone was in a great frame of mind, savoring each second of what would be the last show for a while. The starting sequence of Brown Sugar, Start Me Up, IORR, and Don�t Stop was the same as Friday. Differences between the two nights started with the last part of Don�t Stop, which sustained in intensity as Mick ad-libbed over the thrash of the three guitars and thump of Daryl Jones� bass. The heavy rains on Saturday and 50% chance of rain for the show no longer were a concern as it became a comfortable evening. Wild Horses worked great outdoors, casting a lazy country spell over the Tamar site. Charlie was cracking the drums, sometimes maniacally focused and other times relaxed with a huge smile. Midnight Rambler was one of the evening�s highlights with the bluesy parts stretched out, the rock and roll parts ferocious and Mick leading the �Everybody say OWW! !� sing along part with maximum effect. For Tumbling Dice Keith worked stage right a lot, enabling us on that side to observe and enjoy the great guitar work up close. While Keith�s poignant Slipping Away was a great expression of the sadness and joy of good things not lasting long enough (whether it is scores of shows attended or forty years of awesome music), his set today was better than Friday�s because he played Before They Make Me Run instead of Happy. When Keith and Ron faced off toward the end of this song and weaved the rhythms and leads together it reminded me of how many great versions of this song I�ve been fortunate to see in recent years. It was excellent to have Gimme Shelter two shows in a row, and to see Lisa wow a crowd once more with her vocals, followed by Mick and her dancing and mugging through the duet part of the song. The Stones did not let up as they fired off an especially smokin� You Got Me Rocking. I am always amazed that this song gets such a big crowd response and holds its own with any huge hits around it in the set. I don�t think the army of age 50+ ex-pats around me were delighting in the song as an old favorite from Voodoo Lounge, yet it clearly increased the momentum of the evening. I have to conclude that it proves the power of basic rock�n�roll: whether familiar or not a song that rocks grabs you just as hard hearing it the first time as the 1000th time. Satisfaction concluded the set with Mick working both wings of the stage, running full blast right to left, and onto a small walkway into the front section. The fact that the typical B-stage set up was not used was hardly missed. An encore of Jumping Jack Flash crowned the evening�s frenzy, complete with red and yellow confetti and Ronnie wearing a t-shirt that read �PEACE TOLERANCE & ROCK�N�ROLL�. This was an extraordinary weekend, largely due to the Hong Kong SARS induced make-up shows being independent of an ongoing tour of a geographic region. 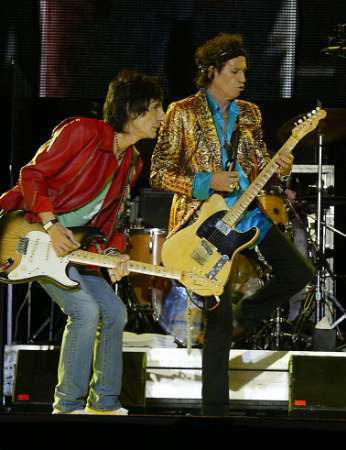 While Hong Kong Harbour Fest was poorly promoted and it was not a concept that the city believed in, the intimate outdoor venue in the heart of central Hong Kong was an amazing place for the Stones to finish the 40 Licks group of live performances. For all of the U.S. basketball arenas or European football stadiums the band has played, to conclude on the waterfront at the foot of Hong Kong�s skyline and in the shadow of the People�s Liberation Army headquarters had an almost dream-like quality to it. While Mick did make reference to it being the tour�s last show, it seems wise to dismiss any thought of this as the Rolling Stone�s last show ever. It is obvious these guys are having far too much fun, and the �last show� concept has been proven wrong so many times before. So let�s start looking forward to the next show, whenever and wherever it will be. To start with i saw the stones when they were on there voodoo lounge tour in Australia so thats how long i have been waiting for them to see them again. I lined up to go in to the venue at 6.30 and while i was lining up i got interviewed by the TV people. When i got in i bought 3 t-shirts 2 for me and one for my wife managed to get the special HK t-shirt a green tounge. I stood by the gate waiting for my friend to come but did not show so i manged to sell his ticket. Then i went and found my seat, i was sitting in section 605, row U seat 11 not bad seats up the back. I also had my big red tounge that my wife made for me. Well about 8.45 the lights went down the intro music came on,then straight into it brown sugar, start me up, its only rocknroll, keith and ronniw were in fine form mick wow so very energetic on stage running jumping toying with crowd, after its only rocknroll was dont stop and then a wonderful version of wild horses i have never heard that one live before. then they did a great version of you cant always get what you want which i was singing at the top of my lungs in fact everyone was singing that song, monkey man mick was dancing like a monkey, then midnight rambler micks harp playing was very good, keith wow his guitar was amazing, i loved the way you thought the song was finished but it started up like a train, they played miss you tumbling dice they were good and then it was keiths turn slipping away was very good his voice was perfect really nice, then he did before they make me run,i think he stuffed that song up abit he forgot the words to the song but it did not matter. After that was sympathy for the devil the crowd got involved with that, gimmie shelter was great lisa stole the show on that song, you got me rocken was rocken, street fighting man, was good honkytonk woman was good the woman and the tounge on the screen was great, i looked around at some chinese people i saw the look on there face (not to happy about that) then they did a very long version of satisfaction and the encore was jumping jack flash. the rolling stones did not let us down i loved every minute of the show and one day hope to see them again. Cool light wind from the harbour but no rain luckily, this November evening was perfect for the last episode of the Hong Kong Harbour Fest, and probably the last show of the LICKS tours. When I arrived at the Tamar site at 7:20 p.m. with my son and daughter, the warm-up show was already halfway, more than 60% of the seats still empty as the tix holders crowding round the Stones Stores, snack stalls and Carlsberg filling stations. The crowd's response to the artists, Joey Yung singing karaoke and Nicholas Tse on guitar with a small live group, was only modest. Nothing wrong with the two local singers. The warm up part last Friday, featuring Mick Gerace doing Elvis covers, did not quite warm up the audience, compared with the Tongue-shirts and beer. I was also there last Friday with a friend of mine, seated way back on raised terraces. This evening my children and me were 12 rows from the stage, seated next to the centre isle. The entry march roared up at 8:50p.m., then the familiar chords of Brown Sugar, and the British rock legends the Rolling Stones took charge of the stage. Tamar, holding an entranced crowd of 13,000, was electrified when Mick�s 1st line: Gold coast slave ship bound for cotton field� was aired. This was such a magic moment, and I was so lucky to feel it again that Sunday evening. Although the suspense about the setlist had gone for me, it was surely a series of delight for the audience. In fact I enjoyed the Sunday show more than first show because I was so close to the stage. Every time Mick edged to the front, I couldn�t stop my feet leaping and my arms inching forward as if my fingers almost feeling the fabric of his sleeveless Tongue-shirt. Right after a series of YEAH, YEAH, YEAH� � WOO with the half-delirious crowd, the band went straight into Start Me Up, then IORR after Mick telling everyone great to be here in HK. Don�t Stop featured Ronnie�s guitar and his cam mounted around its neck. I felt like doing a rock piece on stage, so did everyone. Wild Horses was the first bonus for me, replacing Angie they did on Friday, then Monkey Man and Midnight Rambler in exchange for Paint It Black and YCHMK. MR, in extended version, was really an extra not just for me but for everyone. Charlie did an excellent job for this piece. He was cool, had no sweat and hands never went up higher than his own eye level, yet setting a firm rock foundation for the band on top of it. The band played 19 songs including Satisfaction (Mick introduced this classic by asking the crowd, �Are you ready for a little bit more? 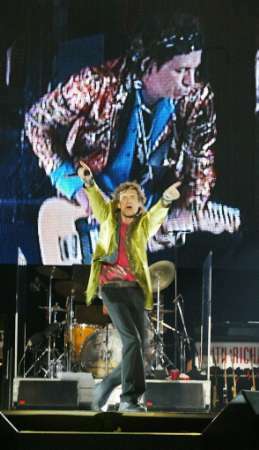 !�) and the encore Jumping Jack Flash. � �But it�s all right now, I�m Jumping Jack Flash. It�s a Gas! Gas! Gas!� � Confetti snowing. I turned backed and saw a delirious crowd swaying, singing, dancing, and I wished it would last forever.